The amounts suggested here are meant for one user per one session and only apply to high-quality, potent, pure and noble kava products. Low quality kavas are unlikely to be enjoyable at these or any other doses. At the same time, note that each person requires a different amount of kava to feel and enjoy its effects. Remember to consume kava slowly and in moderation. 1. Approximately 35g (1/3-1/2 cup) of traditional kava powder. Some of the finest kava powders in the world can be bought through our Kava Shop. 2. Strainer bag. Some people use classic "Fijian-type" strainer bags, cheesecloth, socks, t-shirts or nylon stockings. However, these options often let too much sediment through and/or are not necessarily food safe . This is why you might prefer to use a finer, food grade strainer, such as a nut milk straining bag , which can produce a much smoother, easier to drink beverage. We personally use and highly recommend getting one of the excellent, food grade kava straining bags that we sell through our Kava Shop. 3. Two cups (around 600ml) of warm (35-40C) water. (In general, we like to use 15-20ml of water per 1g of kava, but feel free to use any ratio you find effective and convenient). 4. One extra cup of water if you wish to make the so-called "second wash". Insert a desired amount of kava inside the bag. Place the strainer containing the kava powder into an empty bowl . Next, pour warm water directly into the bag with the kava (make sure the powder stays inside!). Let this sit in the bowl for a few minutes to loosen the tougher fibres. Twist the top of your kava strainer closed and gently press out all the excess air. Begin kneading the powder that’s inside the bag in the water. Knead the bag in the bowl and from time to time twist it to strain all the water out. After a few minutes your water should turn densly brown and should start feeling a bit oily (that's thanks to the kavalactones being released into your liquid). Use force, but be careful not to rip your strainer! Knead for a few more minutes (max 10 minutes in total) and then squeeze the bag to remove all water from the root particles while not letting any actual root into your ready beverage. Your kava is ready! If you want to, you can pour the ready beverage into a separate bowl and add some fresh warm water (half of the original amount) to your original bowl to prepare a "second wash" using the same bag with kava. It will be much weaker than the first one, but it can still offer some nice effects (you can add it to your original mix or drink it separately). Place the desired amount of kava into your blender. Add cold water at 1:15-20 ratio (1 gram of kava powder to 15-20ml of water depending on your preference). Blend on high for 3-4 minutes. You may add a teaspoon of coconut oil which might help to extract fat soluble kavalactones. Once you finish blending it, pour the mixture into your strainer bag and strain/squeeze the kava into a clean bowl. Wait until it cools down or add a couple of ice cubes and enjoy. 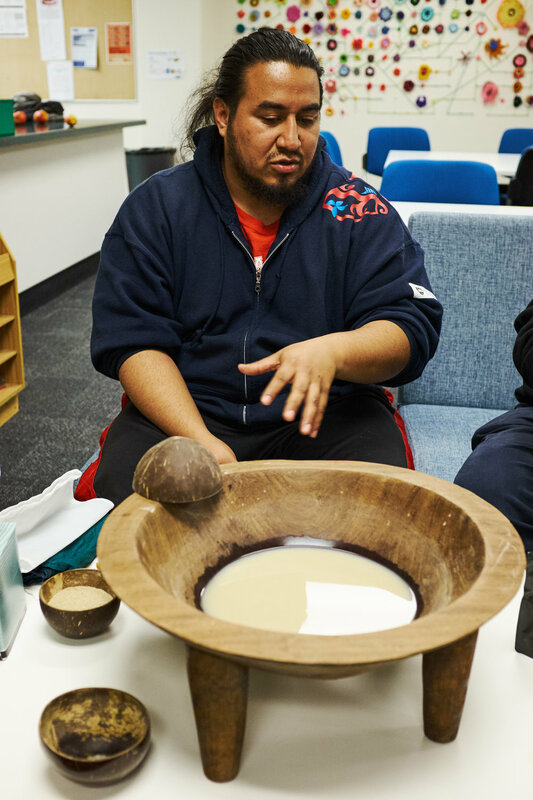 Kava servings should be chugged quickly in order to prevent the sediments from settling down and also because it's not very pleasant to sip it slowly. Drink one shell of kava (half a cup or 100-150ml) at a time. It is a very good good idea to use a chaser (e.g. a fresh fruit or some coconut milk) to wash away the earthy kava taste. Take at least 15-20-minute long breaks between servings as it may take a while for the kavalactones to start acting and for you feel the effects. Remember that kava works best on an empty stomach (try not to eat anything for at least 3 or 4 hours before drinking kava). apx 10-15g (apx 3 teaspoons) of micronised kava or instant kava. Just like fine traditional powders, top-notch micronised and instant kavas can be bought through our Kava Boutique (subject to availability). Two cups of cold water (ideally purified and chlorine-free) or any other soft drink/fruit juice mix you like. Add micronised powder to your choice of liquid and stir it well. You can either start by just mixing 1-2 teaspoons of powder in one cup of water or prepare the whole amount in a bowl or jug. Micronised and Instant kava can be skulled (just like medium grind) or sipped slowly when mixed with some juice. If you drink it slowly, remember to stir it occassionally. If you mix it with nothing but water, drink half a cup of kava (or one coconut shell) at a time and use a chaser (e.g. a fresh fruit) to wash away the earthy kava taste. Take at least 10-15 minute long breaks between shells as it may take up to 15-20 minutes to feel the effects. Remember that kava works best on an empty stomach (try not to eat anything for at least 3 or 4 hours before drinking kava). Also note that some people experience the so-called "reverse tolerance" and they need to try kava a couple of times before they can enjoy its effects. Freshly prepared traditional kava (our famous Pacific Elixir blend). Auckland University (2017). Kava is known for its well-documented "reverse tolerance" phenomenon meaning the effects of kava may not be felt fully with the first couple of times of use. Most first time users need to take kava for a few of days before its benefits become clear. Stirring traditionally prepared kava in a wooden kava bowl. It's important to mix the kava before each serving to make sure the resinous sediments are evenly distributed around the beverage. The reason why one should always use a straining bag when preparing traditional grind kava powders is that they usually contain hard fibres called "makas" that can cause extra nausea. Straining traditional grind powder is an effective way of keeping these fibres out of the beverege. Note that, properly produced micronised kavas (such as the micronised kavas sold by our little shop) and instant kavas are free of makas and can therefore be mixed directly with water or juice. Micronised kavas are more potent per gram because your body absorbes and digests much more of the kavalactones that could otherwise be extracted from traditional grind powder using traditional methods of preparation. At the same time note that even the finest micronised kavas are more "gritty" and more likely to cause stomach discomfort than properly strained traditional powders. This is because they do contain more of the root material. By contrast, instant kavas offer similar per gram potency to micronised while being as smooth as properly strained traditional grind kavas because they are made by simply dehydrating strained (ideally fresh/green) kava. Kava works best when consumed on an empty stomach. At the same time, it is a good idea to use some light chasers in between kava shells/cups and to consume a light, warm meal half an hour after your kava session. Kava doesn't usually have a very pleasant taste. One remedy is to use good chasers, such as fresh fruits, caffeine-free tea (e.g. rooibos or peppermint) or non-alcoholic ginger beer (made from real ginger root).